We offer the opportunity to privately hire RampWorld Cardiff to yourselves! At Rampworld Cardiff, we provide some of the best private booking and parties available. We provide 2 or 3 hours private hire for the whole skatepark starting from £100. Private hires are very popular, we advise booking at least 2 months in advance. We provide a private rental of RampWorld Cardiff for either 2 or 3 hours on selected days. 4-6pm, 6-8pm or 8-10/11pm on Mondays. No other slots are available. £100 for 2 hours, £150 for three hours. The price is for the first 15 people, then its £5 extra per person thereafter. We have two options available, 2-hour sessions which are the most popular option £100, or we offer a 3-hour session on the 8 O’clock session, £150. * – For the first 15 participants. The maximum number of participants is 200. 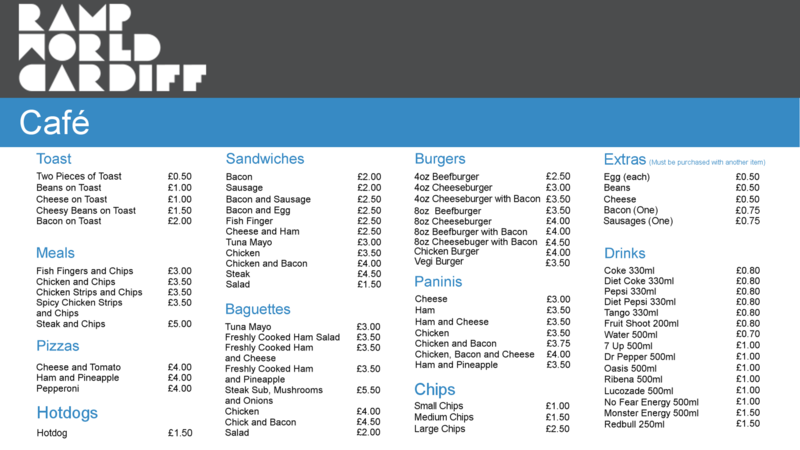 We also have a Café and catering options available. Please let us know in advance, we can do 10% off these prices for parties. Or we can do a basic meal deal of a Can of Pop and a Hotdog for £2 per person. We provide a private rental of RampWorld Cardiff for either 2 or 3 hours on selected days. The price includes is for the first 15 people, then it’s £5 extra per person thereafter. We set rules for the safety of our customers. Please read carefully. All scooter riders and everyone under the age of 16 must wear a helmet at RampWorld Cardiff. No Exceptions. All Scooters and Bikes must have Bar end plugs fitted to their handlebars, we sell them in the park for £4 a pair. We do not rent helmets. We do not permit fold up or three-wheel scooters in the park. We also do not permit the mini bikes with wheelbarrow tyres. Real 12″, 14″, 16″, 18″ BMX bikes and balance bikes are allowed. All participants attending the private hire must sign up using RampWorld Cardiff new membership registration system. It’s a free service. We strongly recommend completing all registrations before attend.